Have you noticed that you have ball of foot pain? It may have started as a minor ache and you now have significant pain when walking. You may also notice that there is burning in the foot when on or off your foot. There are many reasons that you may have ball of foot pain but they all stem from foot instability and abnormal function of your foot. You can have this instability with an arch that has fallen or a high arch. If you push on the bottom of your foot and feel a hard knot that is painful, this is likely due to a prominent bone called the metatarsal with surrounding soft tissue swelling. 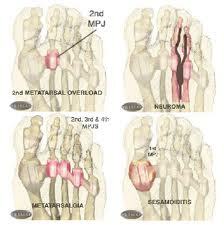 You may also have some decreased fat padding leading to increased pressure on the ball of the foot. Many doctors will call this metatarsalgia. With this increased pressure, you may develop thick skin or callouses. These can be painful also but are the result of the bone which has become enlarged or prominent. Removal of callouses and pads can give temporary relief but your main treatment should be a custom arch support also known as an orthotic. All arch supports are not created equal. See a podiatrist for the best treatment and orthotic. In some cases surgery may be the answer and your podiatrist can help you make that decision. If you do have callouses and have diabetes, you should see a podiatrist and avoid removing these yourself or using medicated pads which can cause burns and infections. So, if you don’t seem to have this type of problem and you experience, burning on the ball of the foot and possibly burning in the toes, you may have an enlarged nerve or neuroma. In some cases, the nerve may be normal but a tendon or inflamed joint may be pressing the nerve. Your podiatrist can help make the diagnosis so that your treatment plan can be customized for relief. Of course there may be other causes for ball of foot pain such as an enlarged bone known as the sesamoid, arthritis and pain of the big toe joint, stress fracture, or even gout. So how are you going to get relief? Your best bet is seeing your podiatrist and have an exam and some simple tests and get the best treatment for you.